Our DeKalb County Auburn Tri Kappa friends are busy getting ready for their 3rd Annual Pink Out on Thursday, May 18th! "The Auburn Chapter of Tri Kappa is so grateful to partner with Francine’s Friends to complete our mission educating DeKalb County community members about the crucial importance of early breast cancer detection," said Pink Out spokesperson Natalie Taylor-DeWitt. "Francine’s Friends is able to service our community in the most convenient way by coming directly to businesses and organizations. The coach provides women a safe and comfortable environment for mammograms. The volunteers who run this organization have become our forever friends in saving women’s lives all over Northeast Indiana, especially DeKalb County." "Francine's Friends is so happy to support the DeKalb County Pink Out and our special friends of Tri Kappa!" echoed Sharon Simmons, Francine's Friends board president. "Early detection is our best protection and Tri Kappa is dedicated to spreading the word about the importance of regular screening mammograms. 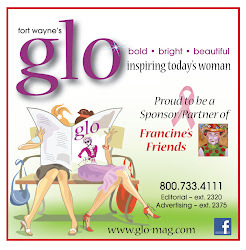 Partnering with Tri Kappa and Pink Out is a natural for Francine's Friends." To schedule a mammogram, call 260-483-1847 or 1-800-727-8439, ext. 68120. View photos of last year's Tri Kappa Pink Out DeKalb County. Visit the Auburn Tri Kappa website. Like and share this event with your friends on Facebook!